Thursday 21st August 2014 @ 7.30pm. Bottesford Chapel Meeting Room, Devon Lane. Self-nominations to take part in the training are now sought. Val L agreed to post posters advertising the launch event around the village, these to be prepared asap. The addresses of those commemorated on the war memorials to be forwarded to Bob S, for incorporation in the village map. A number of memory sticks are to be purchased – 32GB for circulating large files (3/4 suggested – 10 ordered). Volunteers requested to assist in erecting the display material in the village hall from one o’ clock on 28 September, Vic M agreed to produce a list of contact details for said volunteers. For the launch event a pro-forma, to record details of villagers who express an interest in their relatives being researched (whether by themselves or on their behalf by others), is to be produced. Details of St Mary’s church service on 14 November to be forwarded by Malcolm O to Dave M.
Everyone is welcome to attend the launch of the The Bottesford Parish 1st World War Centenary Project on Sunday 28th September at the Bottesford VC Hall at 4.00 pm. Come along and find out what will be happening over the next two years to mark and commemorate the centenary of the 1st World War in Bottesford, Easthorpe, Muston and Normanton. See what the project is doing. Listen to music of the time. Tell us about family members who served in WW1. Bring along any family memorabilia from the 1st World War. Meet the volunteers working on the project. Learn about how your family can help. Refreshments provided with the kind assistance of the WI. Of the 40 men on the war memorials photographs of 34 of them have been obtained. Training days for the new website will be held on the 24th and 31st of October, between 10.30 and 3.30. Self-nominations to take part in the training are now sought. 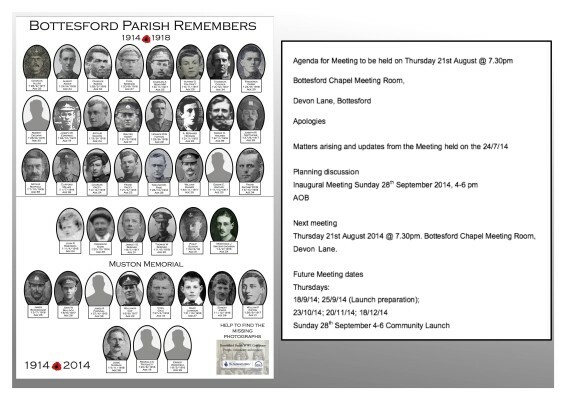 The addresses of those commemorated on the war memorials to be forwarded to Bob S, for incorpation in the village map. A number of memory sticks are to be purchased – 3 or 4 were suggested. This page was added on 02/09/2014.